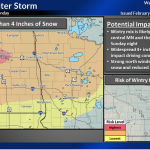 The National Weather Service tells KBMW News that a winter storm will be moving through the region on Sunday, February 4th through Monday, February 5th. 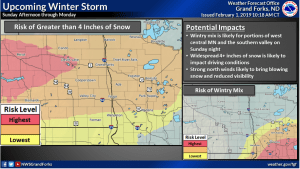 Parts of North Dakota and northern Minnesota will receive four or more inches of snow, however the southern Red River Valley and central Minnesota will receive less. Strong winds will likely cause blowing snow and reduced visibility Sunday night into Monday. In the days following the storm temperatures will dive, bringing dangerous wind chills of -20F to -40F at night and in the early morning.